Is Artificial Grass a Snowpack Solution? A snowpack solution is necessary for the long term health of our state. California weather has been consistently dry for the last few winters. Five in fact. However, Governor Brown recently declared emergency drought were over in April of 2017, save for a handful of counties where water use was still a concern. Dwindling snowpack was part of the evidence used to prove the case for instituting original drought water usage restrictions. And the effects of the drought? Those were seen recently when the latest round of wildfires burned hundreds of thousands of acres. The lack of water in the mountains created the perfect scenario for catastrophe. The images and videos posted online were surreal. It was like something from an apocalyptic movie. So where are we now? Are we out of the woods since the April 2017 announcement? Not just yet. You might think this odd since we had torrential rains during the last part of 2017. Remember the Montecito mudslides? Surely all of that rain helped California get back to normal levels. Not hardly. Recent environmental indicators show we are approaching treacherous drought levels again. This should come as no surprise since. the governor did say Californians would need to remain conservationists at heart in order for state water supplies to remain healthy. 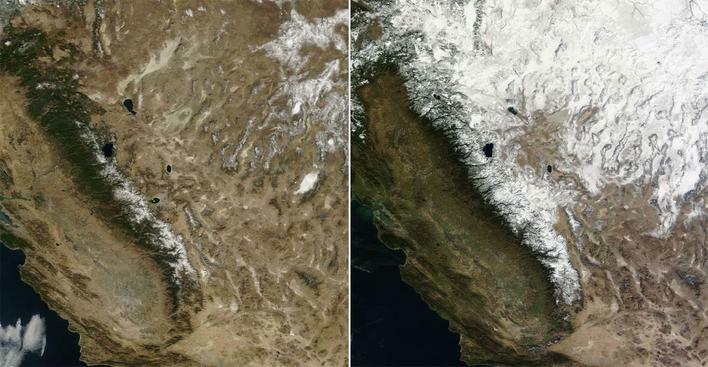 The difference in snowpack can be see in this dramatic image. The right is 2014. The left, 2013. So what happened? Why the alarm? It can all be summed up in one word… snowpack. Even with all of the torrential rain last year, amounts were still lower than expected. In fact, they remained lower than rainfall totals the year before. Since October, the Sierra Nevada mountain range has received 70% of the normal expected amount. That means right around 20 inches have fallen. This directly impacts snowpack measurements. 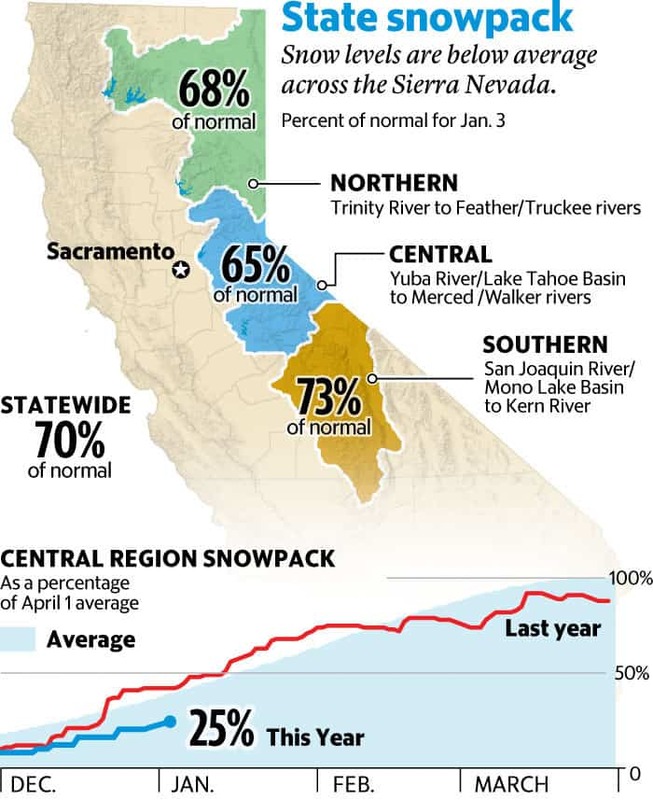 Recent state data found the amount of water held in the Sierra snow was only 27% of the normal amount fund in the region this time of year. A sample taken this February found only 13.6 inches of snow on the ground. The water content of that snow was 2.6 inches which translates to 14% of the expected amount. However, this is much better than last year when a researcher stood on a snow dusted mountain and declared the snowpack yield was only 5%. The bottom line? A snowpack solution is needed. Yet is this cause for concern? It should be. Snowpack plays a key role in keeping California water reservoirs full. When the snow melts, run-off supplies the state’s reservoirs with water to the tune of 30% annually. The low snowpack amount is concerning for this reason. Every 30 inches of snowpack that melts equals 12 inches of usable water. With current snowpack levels of only 13.6 inches, the amount of water generated would only be 30% of the normal annual yield. That's not good. That’s a great perspective (not a snowpack solution per say). However, if reservoir supplies continue to dwindle due to consistently low snowpack levels, California could see a reinstatement of emergency drought rules. These regulations work to do one thing… curb water use. So it’s best to take current conditions seriously and formulate a plan.California does It takes snowpack very seriously. Levels are measured constantly. There are several snow pillow stations scattered throughout the Sierra Nevada mountains under continuous surveillance and monitoring. Several other stations also get manual readings periodically. Those are compared against electronic readings to generate a true snapshot of current snowpack levels. This makes sure forecasters have the right data to work with when speculating against future drought conditions. If winter gets more rainfall, things will likely turn around. If not, we will have to cut our water usage significantly. This will help the environment remain stable until rain and better weather improve water reservoir levels. In the meantime, we need to be heavily invested in a water conservation mindset. There are many things we already do to preserve water and it makes a difference. However, there is one consideration that trumps other means in significant ways. It not only makes a definitive impact on the environment, but eliminates weekend chores too. What would that be exactly? An artificial lawn. They make a drastic impact on snowpack levels if enough individuals use them in place of traditional lawns. The benefits are tremendous, and not just as a snowpack solution. Think for a moment. No watering, durability, and evergreen enjoyment year after year. And, when it rains? Water goes straight to the water table rather than getting sucked up by thousands of roots in your lawn. 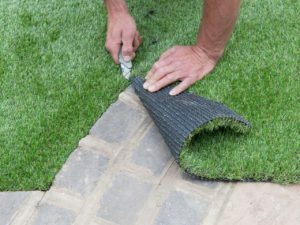 Artificial grass uses rainfall to its full potential. How is that for conservation? Second, kiss lawn maintenance goodbye. That’s right, you might as well sell your lawnmower. Trade it in for sitting on your front porch. You can watch your neighbor mow theirs instead. The best part? In just a few years, your artificial lawn pays for itself. All you have to do is occasionally spray it with a water hose to keep the lawn clean. Installing a synthetic lawns is one of the best things you can do to make a positive impact on the environment. California will be on alert for some time until snowpack levels and rainfall return to normal. Making the transition to an artificial lawn now will curb the effect of drought restricted water usage. If you have been considering artificial grass as an alternative, get in touch with us. Artificial Grass Pros has the experience and expertise to turn your lawn into a show stopper. Our installers are some of the most experienced in the field and we stand behind our 15 year warranty. We will help you transform your space into one amazing, green landscape that will be just as lush and durable for years. Remember, our grass does not fade, grow or attract bugs and other yard pests. 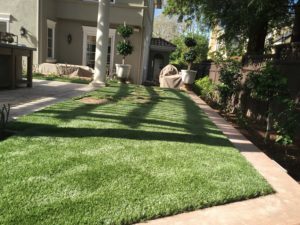 Rest assured, when you choose Artificial Grass Pros, your lawn will stand the test of time, regardless of drought or snowpack levels. Why let your lawn fall prey to California weather? A lawn installed by Artificial Grass Pros will keep it weatherproof for 15 years or more! Not only is it a smart move, It’s a move you can feel good about. Think of it as a fantastic way to create one big masterpiece work of art as well as provide a sustainable snowpack solution. Like we said before, if enough people make the switch, we can probably move the needle on the snowpack issue, especially when readings are consistently below normal. Together, we can not only save the Sierras, the health of our entire state. Contact us today and let’s talk about your lawn.